Students at Pattonville High School who are proficient in two or more languages will have the opportunity to earn the Missouri Seal of Biliteracy honor. 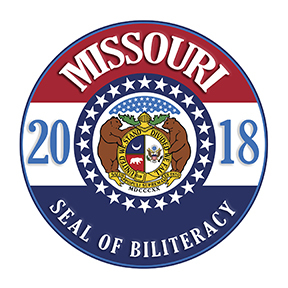 The Seal of Biliteracy is a program created by the Department of Elementary and Secondary Education (DESE) and implemented in districts throughout Missouri. The program promotes active participation in a global society and economy and encourages and recognizes the study of a second language and the cultures and languages within the community. Pattonville is one of only six districts statewide to offer the program. The Seal of Biliteracy can be obtained by all high school students proficient in two languages, whether English is their first or subsequent language. The program also recognizes sign language as one students can be recognized for proficiency in. A student seeking to obtain the Seal of Biliteracy will work with a mentor at Pattonville High School who will help them through the process. Students must submit an application and complete three requirements to receive the Seal of Biliteracy: show language proficiency in English and a language other than English and complete a sociocultural competence project. To show English proficiency, students must have an English grade point average (GPA) of at least a 3.0 and either earn a proficient score on the English II end-of-course (EOC) assessment or, if the student is an English learner, receive a 4.0 on the ACCESS assessment. To show proficiency in a language other than English, students must score a 3 or higher on that language’s Advanced Placement (AP) Language and Culture or Literature and Culture exam or receive a corresponding score on one of four other assessments as outlined on the application. The third requirement is a project asking students to demonstrate high levels of sociocultural competence relating to English and the second language. This can include providing translation services for a non-profit community organization or completing a community service project that requires the use of both languages. After completing the project, the student must write a reflection piece. This project must be approved by the student’s mentor. Students who achieve the Seal of Biliteracy will be recognized and will have the honor noted in their transcripts. Some colleges and universities are also honoring students who receive the Seal of Biliteracy. Currently, Missouri State University, Missouri Southern State University and the University of Central Missouri have committed to offering 12 hours of credit to students who earn the Missouri Seal of Biliteracy. “There are many Pattonville students who have acquired biliteracy skills and sociocultural awareness. The Missouri Seal of Biliteracy is a great way to honor these students,” said Dr. Tim Pecoraro, Pattonville assistant superintendent for curriculum and instruction. Students who are interested in learning more or applying for the Seal of Biliteracy should contact Gene Grimshaw, assistant principal at Pattonville High School.